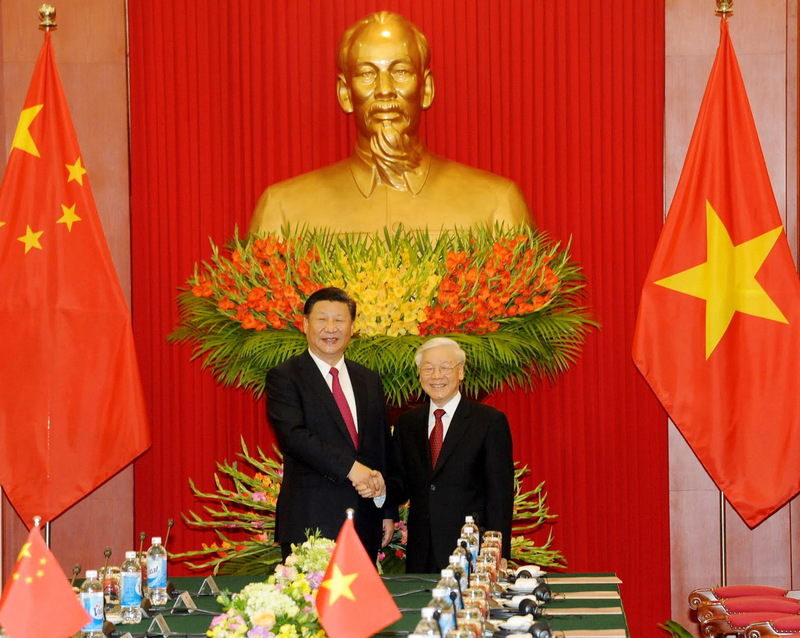 General Secretary of the Communist Party of Vietnam Nguyen Phu Trong and General Secretary of the Communist Party of China (CPC) and President Xi Jinping witnessed the signing of 12 cooperation pacts and the exchange of seven other documents in Hanoi on November 12. A memorandum of understanding between the Vietnamese and Chinese governments on promoting connection between the “Two Corridors, One Belt” framework and the “Belt and Road” Initiative. A memorandum of understanding between the Ministry of Industry and Trade and China’s Ministry of Commerce on speeding up negotiation for a framework agreement on building border trade cooperation zones. A memorandum of understanding between the Ministry of Industry and Trade and China’s Ministry of Commerce on the establishment of a working group for e-commerce cooperation. A document between the Vietnamese and Chinese governments on studying the pre-feasibility of a project on a development aid for the construction of two new traditional medical centres in Vietnam. A memorandum of understanding between the Ministry of Investment and Planning and China’s Ministry of Commerce on human resources development. A memorandum of understanding between the Ministry of Investment and Planning and the Chinese Ministry of Commerce on building a list of key cooperation projects in the five-year Vietnam – China trade development planning for 2017 – 2021. A memorandum of understanding between the Ministry of Industry and Trade and China’s National Development and Reform Commission on boosting cooperation in electricity and renewable energy. A memorandum of understanding between the Ministry of Culture, Sports and Tourism and China’s Ministry of Culture on cultural industry. An action plan between the Ministry of Health and China’s National Health and Family Planning Commission on health collaboration for 2017 – 2020. A memorandum of understanding between the State Bank of Vietnam and China’s Banking Regulatory Commission on cooperation and exchange of banking inspection information. A cooperation agreement between the Ministry of Defence and China’s Ministry of National Defense on border patrol. Meanwhile, the seven documents exchanged dealt withpersonnel training between the provincial party central committees of Quang Ninh, Lang Son, Cao Bang, Ha Giang and the regional Party Committee of China’s Guangxi Zhuang Autonomous Region; scientific exchanges between the Vietnam Academy of Social Sciences and Chinese Academy of Social Sciences; cooperation in legal framework for the management of nuclear safety between the Vietnam Agency For Radiation and Nuclear Safety and China’s National Nuclear Safety Administration; cooperation for 2017 – 2022 between the Vietnam National Political Publishing House and China Foreign Languages Publishing and Distribution Administration; press exchange and cooperation between the Vietnam Journalists Association and All-China Journalists Association; principles to set up a chapter of the Agricultural Bank of China in Hanoi; and investment in the construction of a tyre manufacturing factory.